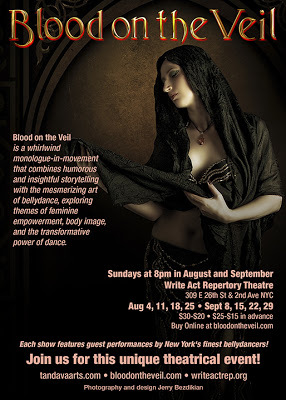 Review Fix chats with writer/performer Carol Henning who discusses her critically acclaimed one-woman show, “Blood on the Veil: A Bellydancer’s Journey Towards Healing, Transformation & the Divine Feminine,” which is currently playing at the Write Act Repertory Theatre, 309 East 26 Street, NYC through the end of September. In the interview, Henning also shares her thoughts on beauty, the art of belly dancing and how she’d like the audience to feel once they leave the show. Witty, charismatic and engaging, Henning’s work has already garnered a plethora of buzz in the New York City area. For those who enjoyed the interview and wish to see the show, you can get five dollars off your ticket by using the discount code “ReviewFix” when you buy tickets at BloodOnTheVeil.com.